Scientists are planning to use NASA's Hubble Space Telescope to observe next month's historic transit of Venus across the sun's face. But there's a twist. Researchers can't point Hubble anywhere near the sun, because our star's bright light could damage the telescope's super-sensitive instruments. So Hubble will watch the June 5-6 Venus transit by using the moon as a mirror. The goal is to see if Hubble can determine the makeup of Venus' atmosphere by studying sunlight that has poured through it. Astronomers already know a great deal about Venus' air, so next month's observations are a test run to see if the technique could be used to determine the atmospheric composition of faraway alien planets, researchers said. Hubble will be locked onto one location on the moon's surface for the entire seven-hour transit, during which Venus will appear as a tiny black dot crossing the sun's face. Astronomers need the long observation time because they're looking for extremely faint spectral signatures. Only 0.001 percent of the sun's light will filter through Venus's thick atmosphere and be reflected off the moon, researchers said. The team will use several different Hubble instruments — including the Advanced Camera for Surveys, the Wide Field Camera 3 and the Space Telescope Imaging Spectrograph — to view the transit in a range of wavelengths, from near-infrared to ultraviolet light. Hubble will snap images and perform spectroscopy, dividing the sunlight into its constituent colors. Astronomers using NASA's Hubble Space Telescope took this photo of the moon's Tycho Crater in January 2012 to help prepare for the transit of Venus across the sun's face on June 5-6. of that year. Hubble observed the transit, using the moon as a mirror. Astronomers have already begun training for the events of June 5-6. In January, for example, Hubble took some photos of the moon's Tycho Crater, a huge hole in the ground about 50 miles (80 kilometers) wide. During the test observations, researchers made sure they could repeatedly point Hubble at precisely the same target area. Next month's Venus transit is a special event — the last chance for astronomers and amateur skywatchers alike to watch the planet trek across the solar disk. 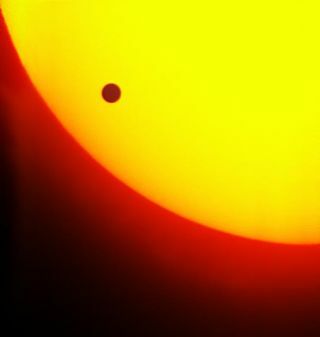 The last Venus transit occurred in 2004, but the next one won't happen until 2117. The Hubble Space Telescope celebrated its 22nd year in orbit earlier this month. The instrument launched in April 1990, and over the years it has made more than 1 million observations of the universe.